Freshman pitcher Michaela Hood continued her string of successful appearances in game one, and Montana’s hitters were unable to come up with the key hits in game two as the Grizzly softball team split its Big Sky Conference openers against North Dakota on Saturday at Grizzly Softball Field. 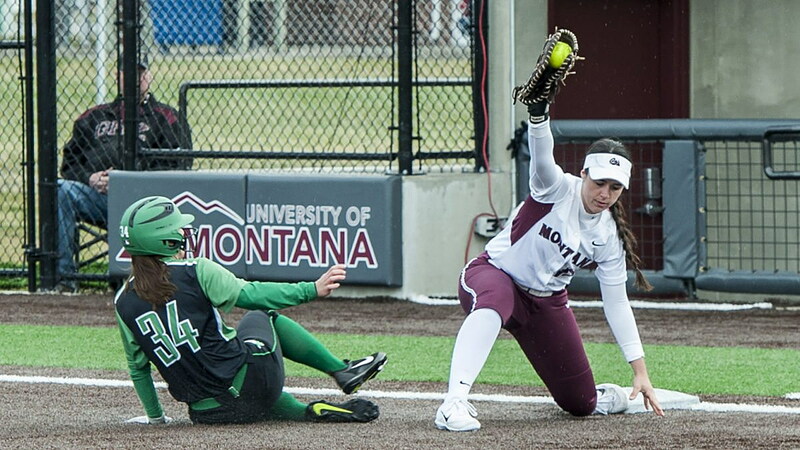 Hood, who won her sixth consecutive decision to improve to 7-2, scattered seven hits and pitched her sixth complete game of season as Montana took the opener 6-2. In the second game, the Fighting Hawks’ Hannah Berg gave up 10 hits but only allowed three runs — one through the first six innings — as she pitched herself into trouble but also pitched herself out of trouble. Montana left eight on base and fell 5-3. The teams will play the final game of the series on Sunday at 1 p.m. The pitchers’ duel between Hood and North Dakota’s Kaylin VanDomelen, who leads the Big Sky in ERA, in the series opener never really developed as VanDomelen struggled with her control early and put her team in a hole. She had a wild pitch, hit a batter and walked in a run in the first as Montana jumped out to a 2-0 lead. A defensive miscue on a stolen base by Bethany Olea in the second allowed two unearned runs to score, and the Grizzlies led 5-0 after just two innings. North Dakota put runners on base the final five innings but could only push two across against Hood. VanDomelen doubled to right to drive home a run in the fourth, and Marina Marzolino belted her first home run of the season in the sixth, but that is all the runs Hood would allow. She walked four, including two in the fifth as the Fighting Hawks threatened, but she also had six strikeouts. Montana’s top five players in the batting order — Gabby Martinez, Ashlyn Lyons, Bethany Olea, Delene Colburn and Sydney Stites — collected all seven of the Grizzlies’ hits, with Lyons and Olea both collecting a pair of singles. With VanDomelen out of the way, it felt like Montana was ready to go over .500 for the first time this season in game two, but Bergh, who now has more wins on the season (7) than VanDomelen (6), had other ideas. In the bottom of the first, Olea, who would go 4 for 4 and finish 6 for 7 for the day to up her season average to .436, singled down the left-field line with two outs. Delene Colburn, named the Big Sky Player of the Week on Wednesday, lined out to third base to end the inning. And it would be that kind of game, with plenty of chances but hits that didn’t come at the right times. “We had opportunities to win that game. We had opportunities to cash in. We put runners on base and got into some hitter-favorable counts, and we got ourselves out,” said Pinkerton. Batting in game two as the designated player, VanDomelen put North Dakota up 2-0 in the top of the third with a home run off Montana starter Colleen Driscoll, VanDomelen’s third of the season. The Fighting Hawks would chase Driscoll in the fourth as they went up 3-0 on a sacrifice fly. Montana got on the board in the fourth when Stites led off the inning with a home run to left-center, her fifth of the year. But the game would be defined by what Montana was unable to do at the plate, particularly with runners on. Colburn came up in the third with runners on second and third and fouled out to first. She came up again with two on in the fifth and grounded into a fielder’s choice. With two runners still on base, Stites followed with a strikeout. With runners on second and third in the top of the seventh, and North Dakota leading 3-1, VanDomelen went ahead 2-0 in the count and was walked intentionally to load the bases with two outs. Taylor Nadler doubled to left-center to drive in two and make it 5-1, two big runs as it would turn out. In the bottom of the seventh, Martinez drew a one-out walk. With two outs, Olea had an infield single, and Colburn followed with a double to left-center that scored Martinez and Olea and pulled the Grizzlies within two, 5-3. With Stites coming to the plate as the tying run, North Dakota went to VanDomelen, and she struck out Stites swinging to end the game. VanDomelen picked up her third save of the season. Driscoll took the loss to drop to 3-5.